...without the hassle and expense of renovating! 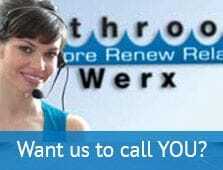 Bathroom Werx transforms your bath, basin, tiles & shower back to NEW, ready to use in just 24 hours! To save you money, time and hassle, we do it all on the spot. Get rid of those dated colours in your bathroom with no mess, no expensive plumbing or structural changes! All without the hassle of having countless tradesmen trampling through your home for weeks while not having a bathroom to use. The unique Bathroom Werx Re-enamelling Process will restore your old bathroom back to NEW in the colour of your choice so that when our Technicians leave, your bathroom will be ready to use again in just 24 hours! And it is guaranteed in writing for 7 Years giving you peace of mind and backed by over 30years experience. CALL NOW ON FREECALL 1800-644-171 and we will send you a FREE Information Package on how you can make your old bathroom look like NEW again for a fraction of the cost of replacing! Our unique Werx Enamel is made in Australia from the finest materials and specifically formulated for bathroom sanitary ware. It is made to withstand the heavy punishment and use that bathrooms are subjected to. It will restore your old bathroom back to NEW in the colours of your choice so that when our Technicians leave, your bathroom will be ready to use again in just 24 hours! The unique Werx Enamel has taken over 25 years and hundreds of thousands of dollars of Research and Development to perfect. Unlike others who use industrial paints, resins and other resurfacing methods that are dangerous to your health, fade, discolour, peel or scratch, Bathroom Werx, the bathroom resurfacing specialists, completely re-enamel your bathroom with our commercial strength Werx Enamel designed specifically for the heavy use and punishment bathrooms are subjected to. No plumbing, No re tiling and No mess! 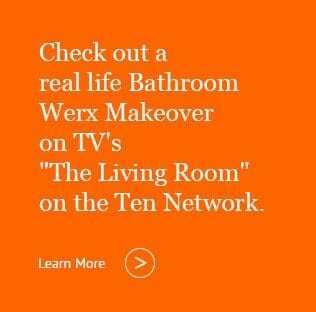 If you are interested in learning more about owning your own Bathroom Werx Business in your area - Click HERE to learn more.